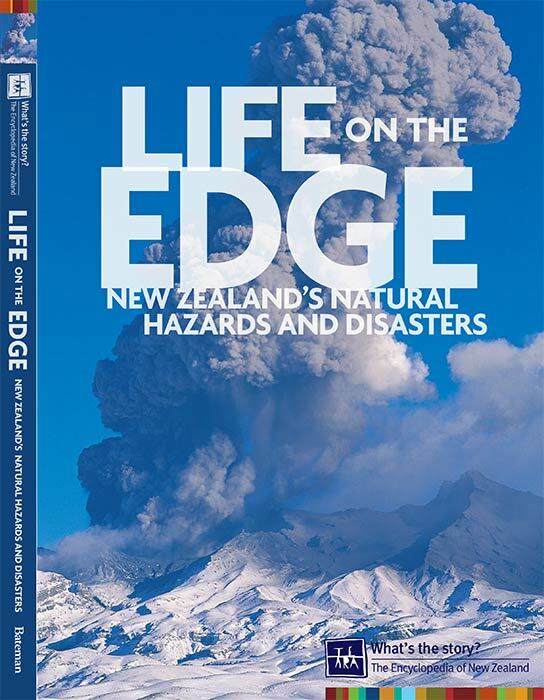 Life on the edge: New Zealand's natural hazards and disasters is a 2007 book based on entries in Te Ara's Earth, Sea and Sky theme. Simon Nathan, a geologist with a strong interest in the history of science, was the editor of this theme, and also of the following theme, The Bush. Te Ara’s second theme, Earth Sea and Sky, deals with the forces of geology and climate that have shaped New Zealand. On my first day Jock Phillips asked me to prepare a list of about 100 topics that would cover the theme. Faced with a blank piece of paper, ‘Natural hazards’ was the first thing I wrote down. Floods and landslides occur every year somewhere in the country, and every New Zealander can expect at least one major earthquake and volcanic eruption to occur during their lifetime. There was some debate over whether tsunami hazard was as important as the others, and initially it was only allocated 1,000 words. After the 2004 Boxing Day tsunami we decided to expand the entry, and Te Ara put out a call for stories from readers about their experiences. The nine articles in the Natural Hazards and Disasters subtheme have turned out to have some of the highest hit rates of any in Te Ara, especially at the time of events such as major earthquakes and tsunami alerts. Science writer Eileen McSaveney wrote or co-authored seven of the articles, so is probably Te Ara’s most highly read author. One of the things that I learnt from working on Te Ara is the unpredictability of hazard events. The 2006 eruption of Raoul Island led us to hastily add a section to the 'Historic volcanic activity' entry, and pages were added to 'Historic earthquakes' after the 2010 and 2011 Christchurch earthquakes. Mt Tongariro had been quiescent for over a century until it erupted without warning in 2012. We can be confident that future events are going to require regular updating of this part of Te Ara.